Out of town and a little off the beaten track, Ganesha Resort is a retreat favoured by long-staying artists and writers, as well as returning guests. A very large plot ensures privacy with accommodations being buried within a beautifully maintained tropical garden, with ample space between them. The main house, an imposing wooden, stone and thatch affair, has the cheapest rooms and an excellent restaurant with a focus on natural, local produce and plenty of vegetarian and vegan options. The locally made ice cream menu, with 24 flavours, will keep you busy for a few days. There are plenty of books and games and even a pool table, all of which made us heartily yearn for rain so that we’d have an excuse to just chill out for a while. For a little more isolation, choose a round ’yurt’ by the small mangrove lagoon or a two-person stilted tribal hut with views over the paddy fields to the mountains. 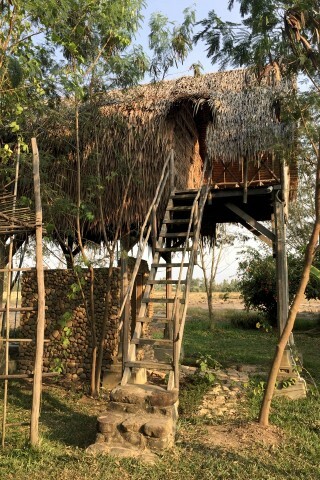 For groups of four to eight people, the Khmer wooden house or the three-storey stone-built tower provide a stay with plenty of personal space. Due to the stilts, steps and proximity to water, most of the accommodation is not suitable for young children. All of the rooms are fan-cooled, and come with mosquito nets and very comfortable beds. The decor is simple and minimalistic, in keeping with the ethos here, but the bathrooms are beautifully done out with hot water showers. Ganesha has riverside accommodation, but it is not on the main river that courses through Kampot. If you’re looking for that try elsewhere. However, some of the bungalows do overlook a tributary that links to the river. You can’t really swim in there, but it is lovely. Ganesha is more about the vibe and the gardens than tubing or anything over-exertive like canoeing. Anyone with a problem with dogs may have difficulties here. There are several of the most beautiful-natured canines we’ve ever been lucky enough to encounter, giving Ganesha an even more homely feel than it already has. Check rates at Ganesha Kampot on Booking.com. Room: Superior double room, low season: US$36, high season US$48. Notes: In The Tower.